Published: June 5, 2014 12:00 am Updated: June 5, 2014 10:35 a.m.
IMPERIAL, Calif. — A military jet slammed into a Southern California neighborhood dense with homes and exploded in flames, but the pilot and everyone on the ground emerged unscathed, officials said. 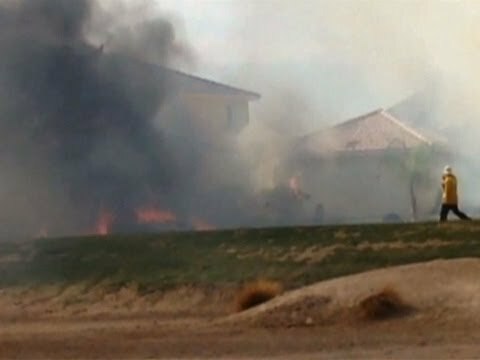 Moments after the pilot ejected to safety Wednesday afternoon, the Harrier jet went down in a residential area of Imperial and destroyed two homes and heavily damaged a third. Eleven-year-old Christopher Garcia was watching TV with his father and brother when he heard a frightening boom. Outside, he said he saw a pilot in a parachute falling from the sky, and what looked like a mushroom cloud of dark smoke two blocks away. He ran to the crash scene to find one house with a collapsed roof, the neighboring house on fire, and a crying woman shouting, "That's my house!" The boy and other witnesses said panicked neighbors were running in every direction. Debris from the Harrier jet hit the roof of one of the houses, which was destroyed, Marine Lt Col John Ferguson said. The subsequent explosion and fire destroyed another house and badly damaged one more. The pilot, the only one aboard the aircraft, landed in a nearby field. He was taken to a hospital for evaluation and released, Ferguson said. Jose Santos had seen the jet go down and was driving to the crash scene when he saw the pilot "rolling from side to side," but looking unhurt. Leonardo Olmeda, 25, was racing remote-controlled cars in a street with many children playing when they saw the pilot eject and the nearby explosion. "It was a big flash, a bunch of black smoke, like a mushroom effect," Olmeda said. The Harrier AV-8B had taken off from Marine Corps Air Station in Yuma and was almost at his destination at Naval Air Facility El Centro when he ejected and the jet crashed for reasons not immediately clear, Ferguson said. It came down in the yard on a street lined with small homes on one side with a large park on the other in Imperial, a city of about 15,000 near the U.S.-Mexico border about 90 miles east of San Diego. Residents of eight more homes had to evacuate for the investigation and cleanup but later returned, officials said. A few hours later, the military said a Navy Hornet crashed into the sea as it prepared to make a late-night landing on an aircraft carrier, but the pilot ejected and was listed in stable condition. This was the second crash in a month of a Harrier jet from the Yuma air base. On May 9, a pilot was able to eject safely before his jet crashed in a remote desert area near the Gila River Indian Community, south of Phoenix. No one was injured. And in July, 2012 another AV-8B Harrier crashed in an unpopulated area 15 miles from the air base, which is among the busiest in the world for the Marine Corps, and is used it to train military aviators from around the nation. Hamilton reported from Los Angeles. Associated Press writers Bob Jablon and Andrew Dalton also contributed to this report from Los Angeles.